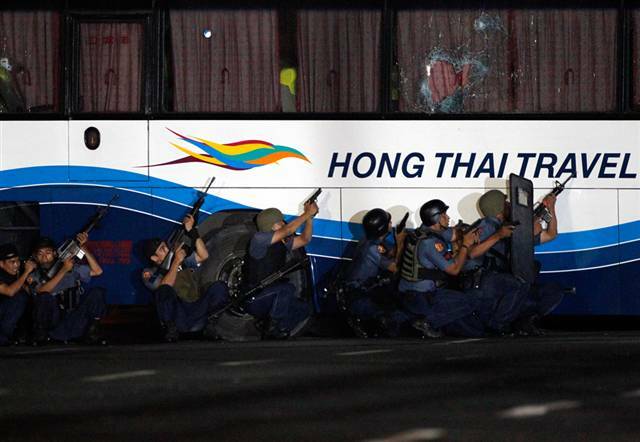 Yesterday, an online photo circulated in which a Philippine police officer posed in front of the Hong Tai tour bus where eight Hong Kong tourists were killed. The officer’s “souvenir” photo angered many Hong Kong artists. Donnie Yen Chi Dan cursed the shameless officer in the photo and asked whether he possessed parents, children, and conscience. Gigi Leung Wing Kei lashed out at the Philippine police for having no discipline. Cherie Ying Choi Yee pointed to the shameful act. Siu Ding Yat and Max Zhang Jin cursed angrily. Hacken Lee denounced the Philippine police officer for taking the photo. Hacken’s wife, Emily Lo Suk Yee questioned whether the officer was human. Hins Cheung criticized the Philippine officer for offending the entire Chinese population. Sammul Chan King Fung denounced anyone smiling in front of the Hong Tai tour bus and using it as a photo prop. Stephy Tang Lai Yan questioned the conscience of the officer. Even Taiwanese artists, A-Mei Chang and Vivian Hsu scolded the hateful and cold-blooded act. Musician, Peter Kam, complained about the photo to the Philippine Consulate located in Hong Kong and Beijing . Jayne: I see smiling tourists at New York City ’s Ground Zero, site of the September 11th Terrorist Attacks all the time. It is ridiculous how some people seem to dismiss the loss of human life so easily. Ground zero is after many years, so a bit of smile is understandable. This philippine one is absolutely vile because it just happened. I am sure no one (no one sane) at the time shortly after 911 would smile into the picture. I was so disgusted when I saw those pics. How cruel and inconsiderate they are to take those pictures. Many people died on this bus, there is nothing to be smiling about. I just can’t believe how inadequate the polices are and couldn’t even take down one gunman. Absolutely disgusting. Can’t believe that the police would do that. As if it’s something they should be proud of? This incident really showed the incompetence of the officers. I really think they could have prevented the deaths of the victims. They had hours to negotiate and they had plenty of opportunities to catch the guy without hurting anyone. They should be ashamed of the way they handled the situation. Yeah, I agree w/ Funn Lim. Hong Kong have not seen this sadness and outraged since probably as far back in 1989 Tiananmen Square protest. I feel for Hong Kong people’s pain, it is truly their version of September 11th terrorist attack. The aftermath of Manlia is really despicable, they really do not have the respect of the victims. Philippines is really going to be devastated with this ongoing continue coverage of this incident and it may not be a very short term recovery. What happened really is tragic and horrible, true. But may we not judge the Filipino people for what had happened. Some might do stupid stuff or even inhumane acts but I believe that that doesn’t define a person. Should not blame the Filipino people? Then who is at blame? Did a random government just suddenly take over and seize the country? The government and police are entirely corrupted and this act clearly shows how disgusting the country is. Of course not everyone in the country is bad but when you have countless atrocious crimes and heavy poverty the peoples inherent personalities are change over time and they turn toward survival mode. Crime can happen anywhere, this is true, but in more uncivilized places like the Philippines it is in abundance and is disgusting. If you do not blame the filipino people then who do you blame? Was this an act of god? Right after this happened HK cut off all trade and flights to the Philippines for good reason. The police had something like a 12 hour stand off and did absolutely nothing. I saw the aftermath on tv and nearly threw up that something like this could even happen. Your post says “some might do stupid stuff” and that is true but this was not the act of one person but many. The gunman did something that happens fairly often around the world, he took hostages. The problem is the entire government and police force in the country..your comment is truly absurd and I felt the need to digitally voice that..
Do you even realize that the people do not control the government. Just because the people in power are corrupt and incompetent, doesn’t mean that everyone in the country is too. If something were to happen in HK for e.g., would you blame the entire populace there for the stupidity of the police? Your statement basically has as much merit as saying all Muslims are terrorists.